This was another epic rotation event and without question within my top five high excitement weather experiences and another close encounter with what I believed to have been a tornado trying to form in very close proximity to me. 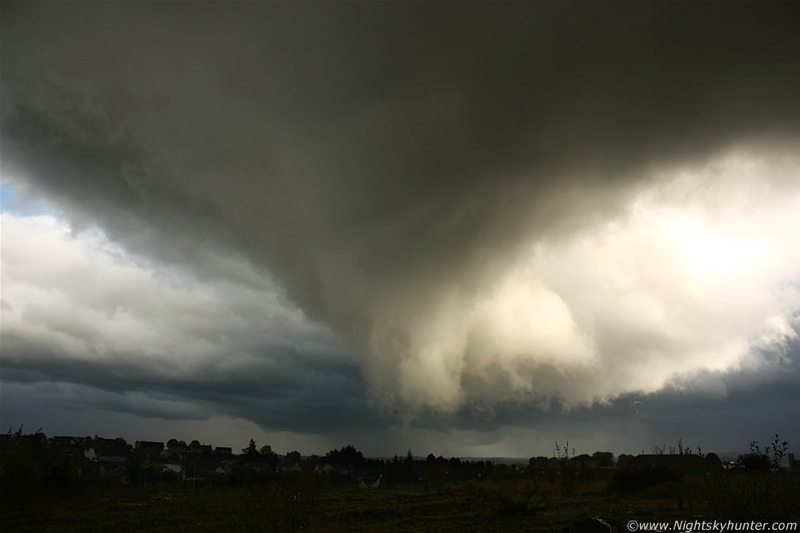 This was taken from near my home on September 16th 2011 in Maghera when this very well sheared thunderstorm moved in from the SW, after a torrential downpour of rain the flanking region came into view sporting a massive rotating wall cloud which even seemed to have a clear cut in one area similar to an RFD or rear flank downdraught on supercells, the leading edge of the wall cloud then began to tighten up and rotate like crazy to the point where I was shouting at it with adrenaline pumping, this leading area of rotation seemed to form the shape of a large funnel which was low to the ground and so close I felt I could have thrown a stone at it. The violent rapid rotation combined with the vertical upward motion like a reverse waterfall was absolutely incredible, read the report for more information. * All images are available for sale in the form of photo prints, canvas or digital files for licensing, if you are interested in a purchase simply drop me an email.